Happy Flash Friday everyone! Today we’re talking about a new shirt pre-order that I can’t believe has taken so long to happen. I remember the big press releases when DC launched the new 52 that part of the reason was to make it more accessible to the non comic reading public. Because of that I was amazed at how long it took for branded items to update to the new looks. I realize that there is a long turnaround time for most merchandise, but it still surprised me. 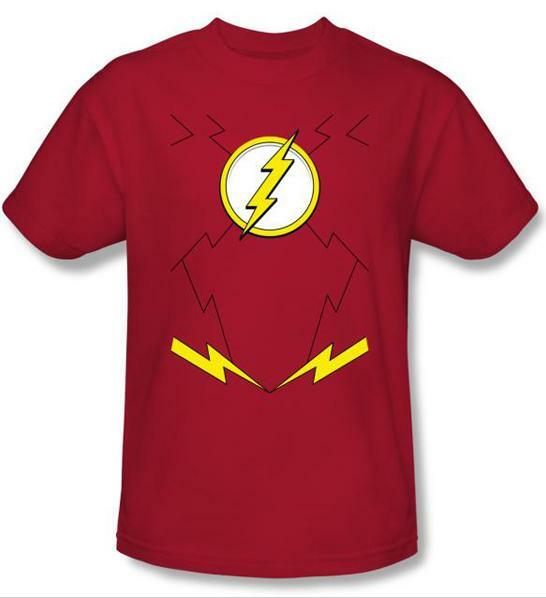 Take for example a shirt made to look like the new Flash costume. I just saw this shirt up for pre-order for the first time. There have been at least three Flash shirts released that show him wearing the new costume but we’re just getting around to the most basic of superhero shirts, the one with the new symbol. You’d think this would have been available the same day issue 1 came out. I remember the Flashpoint shirts were out a whole month before the mini-series even started. If you’re interested in one, I found the shirt listed on urban-collector.com. I’m going to pass on this version. Although all the extra lines and the belt make the shirt more accurate, all I really want is the symbol. I've seen some really cool superhero shirts lately. These look a little plain but still cool!